Appealing TV: Finale? More Like Finally, Am I Right? In the lead-up to this week’s network advertiser upfronts (FOX’s and NBC’s are today, in fact), Friday was hit with a deluge of cancelation news. At the center of this wave was NBC’s Community, which after five seasons has finally ended its run. The announcement sent shockwaves through the #sixseasonsandamovie campus, soothed only by talk of Uncle Netflix perhaps buying the rights to the show. Also, earlier last week, military themed Enlisted was officially canceled, a show I wrote about and rallied for in this very column. There was a truly morbid curiosity on this end, waiting to see which shows will return in the fall, and which ones were mercifully destroyed. Overall, it felt like the Klendathu casualty board in Starship Troopers. To those shows who didn’t make it, I’ll see you at tha crossroads, so you won’t be lonely. So goes the business of television. Shows gets canceled before their time, end up as listicle fodder for shows you should binge watch over a holiday weekend, new shows come in looking for our love and affection and not too much smarm, the cycle repeats. In order to get ready for this week’s upfronts, you should familiarize yourself with Andy Greenwald’s scouting report for the latest crop of network pilots. Your new favorite show could be in there. Or maybe it’ll be something so eminently mockable we’ll all light an ironic funeral pyre to laugh at it in the next life (looking at you, ABC’s Mixology). For a complete list of what’s been canceled, renewed, and will be debuting next season, check out The Futon Critic. Due to the bulk of season enders this week, you’ll have to excuse the abbreviated listing format (although the way I see it, if you weren’t going to watch in September, what is going to want to make you want to watch now, at the end?). An asterisk denotes that the show has been canceled. So, what else is on? I guess all it takes to be renewed at NBC is to have James Spader chew up scenery. Also, don’t be anything else on NBC. Most of the first season of Marvel’s Agents of SHIELD felt like wearing a child sized Avengers t-shirt your out of touch aunt gave you because you took your younger nephews to see Iron Man 3. The last few episodes showed a rally and resurgence, as arguably the most-hyped show of this television season started to find its groove. Help from the second Captain America movie worked wonders, forcing the show to finally tie in to the Marvel Cinematic Universe, which was the rub of the show all along. 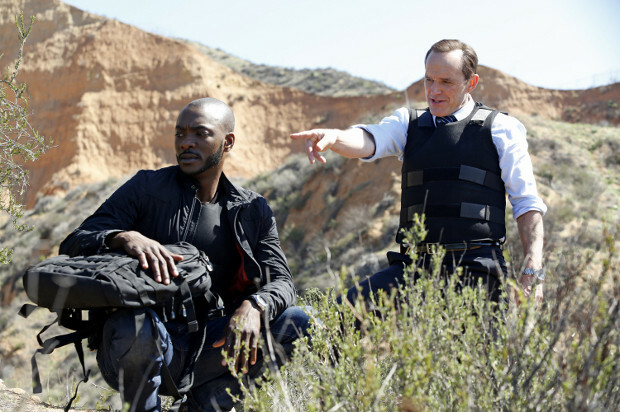 Along with a pickup of Agent Carter for next season, maybe season two of SHIELD can finally become the show we wanted it to be all along. Sketch comedy at a twenty-two degree angle makes it funnier, much how like eating in a revolving restaurant makes the food taste better. It’s physics, everybody. Produced by Steve Carrell. What I appreciate most about Nashville is its call and response style of writing, where each soapy episode is really just a way for every character to get paired up with each other as whatever melodramatic situation gets introduced and resolved in the next episode to continue the cycle. The country music interludes weren’t as great this season, as original music supervisor T Bone Burnett left (I guess to work on True Detective). Much like politics and religion, it is not polite to discuss the Big Bang Theory at the dinner table. Because you might have a person wearing a Bazinga shirt under their trench coat next to the person who edited the Big Bang Theory without laugh track video. Granted, Tyler The Creator and the Odd Future was still in middle school in 2002, but I distinctly remember a conversation in my sophomore English class in 2002 about why there were no black people in the main cast of Jackass. Loiter Squad could have helped us sidestep the entire conversation, as the sketch comedy show is produced by Dickhouse Productions, the same the people that brought us Jackass. Andy Sandberg returns like a conquering hero to his alma mater to host the season finale of SNL, wearing his Golden Globe from Brooklyn Nine-Nine around his neck. He’s brought the goddess St. Vincent along with him as musical guest. We should all be so blessed. Bob’s Burgers is a giddy celebration of weirdness and weirdos and misfits while still possessing an emotional core that is totally earned and not cloying at all. Not too dissimilar from early Simpsons! Also, Bob’s Burgers is about butts. How many people who watched Mr. Selfridge will also be watching the in-production Entourage movie? Another question to ponder: how many people watched Mr. Selfridge because of Jeremy Piven’s performance in Entourage? If it’s not clear, I would very much like to see a venn diagram of people who watch Mr. Selfridge and Entourage. According to Party Down, The Mentalist is a show you’re supposed to watch with your significant other, ergo I know nothing about The Mentalist, besides being surprised this was still on. Paolo Sambrano adores television theme songs. You can follow him on Twitter @paolo. He is the creator of the card game, No Benefits and the writer/performer of the solo show Bi-Poseur.